Borussia Dortmund’s left-back spoke to El Larguero about the lack of relationship he had with Julen Lopetegui, Real Madrid’s former manager. 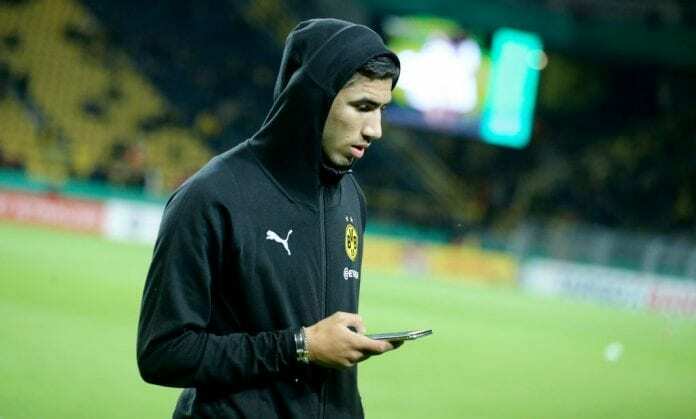 Now that Julen Lopetegui is out and Santiago Solari is in at Real Madrid, Moroccan left-back Achraf Hakimi has a bigger chance to play for Los Blancos due to his good relationship with the new boss. This Monday evening, the Dortmund player offered an interview to El Larguero ahead of his squad’s Champions League match against Atletico Madrid at the Metropolitano Stadium. The Colchoneros lost their first match against the vibrant German squad that is filled with young players such as Achraf, but this will be a very special match for him because of his past as a Madridista and he will certainly try to enjoy it. The last time these two squads faced a few weeks ago, Atletico painfully lost 4-0 at Signal Iduna Park with a staggering three assists from the young Real Madrid product. This impact he is making in German football is a perfect way to convince Los Blancos that he needs to return to the club as soon as possible, everybody thought that he was already in talks with the club due to the fantastic season he is having with Borussia Dortmund. But to everybody’s surprise, Achraf is actually not even planning on a return yet because he only had contact with Lopetegui once. This revelation is nothing but another main reason why Julen Lopetegui was clearly not the ideal man to coach Real Madrid, his lack of understanding of the environment was too great to ignore and his inability to recognize that the young players are the club’s best bet for the future is what doomed him in the end. Achraf is already getting all the recognition he deserves in Germany, and he is also getting all the attention he needs from the club because Santiago Solari is currently in charge. The Argentine manager coached Achraf during his time at Castilla and all he needs now is for Santi to stay as the boss, the player is aware that the opportunity is there and this Tuesday will be key for him to finally convince Florentino that he needs to return and become the next great left-back who can help Marcelo retire with grace and without worrying about leaving his position unprotected. Because of Borussia Dortmund’s visit to Madrid where they will play against Atletico this Tuesday, Achraf agreed to do an interview with El Larguero and spoke about the possibility of going back to Real Madrid and his lack of relationship with Lopetegui. “I didn’t really have a lot of contact with Lopetegui. I only had one phone call with him before the season started to see what my situation was and that’s it,” said Achraf to Cadena Ser’s El Larguero. “But I’m only thinking about the present for now, which is to succeed in Dortmund and make things go well for me. Then we will see what happens later,” he concluded. When do you think is the best time for Achraf to return to Real Madrid? Please share your opinion in the comment section down below.